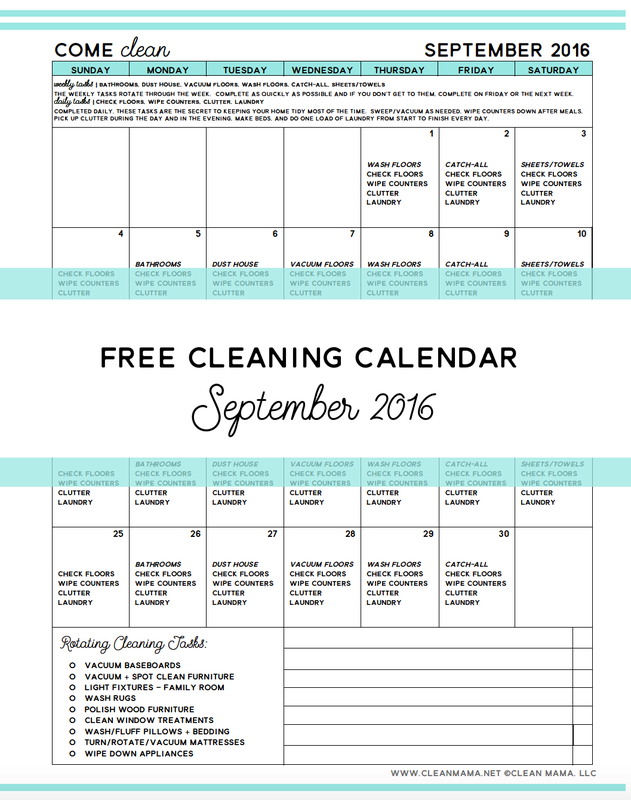 It’s almost September and that means that it’s time for September’s FREE cleaning calendar! 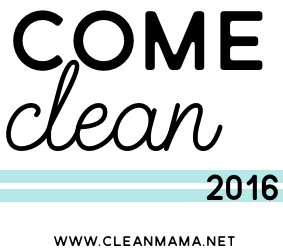 Every year I choose a new theme for the cleaning calendar and blog and this year it’s COME CLEAN. 2016 is the year to get your cleaning routine in order, find some new and workable solutions for organizing, hold yourself accountable, and get your home in a routine that works for you and your family. 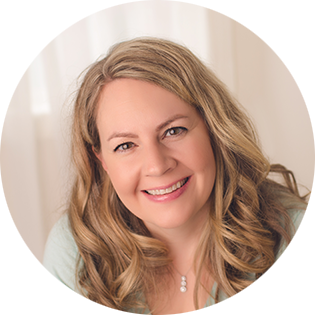 If you’re feeling like you need some help with your cleaning and homekeeping and don’t know where to start, you’ll love my cleaning routine and calendar. I keep daily homekeeping tasks to 15-30 minutes a day and this simple plan is how I do it! This is a workable solution for even the busiest of households – give it a go, I think you’ll be surprised how a little bit every day can make a huge difference in your home. 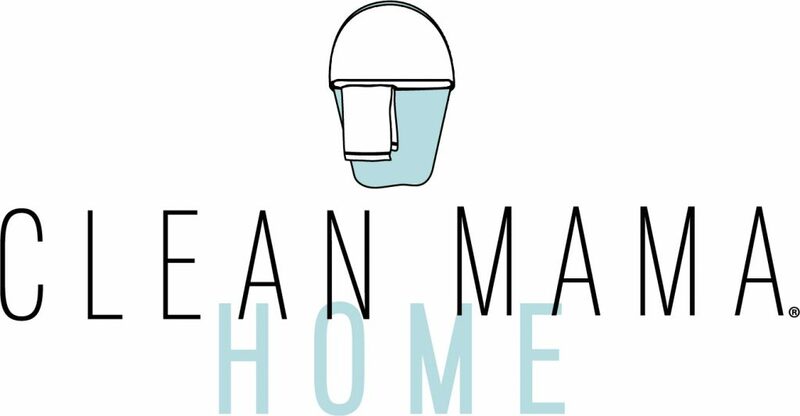 If you’ve been following Clean Mama for even a week, you know that every day is a chance to start over and so is every week, month, etc. 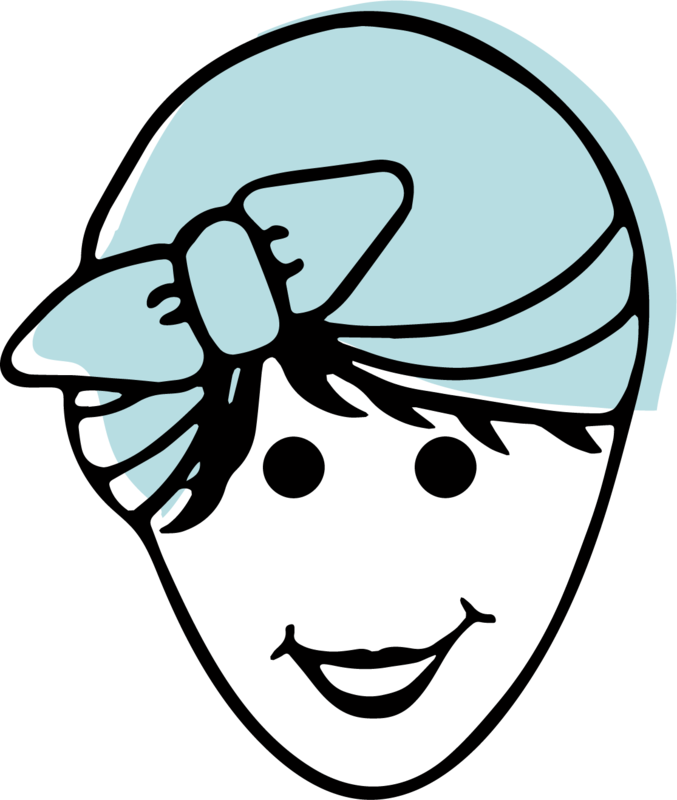 I hope that you find that my cleaning routine is SIMPLE, EASY TO IMPLEMENT, and full of GRACE. 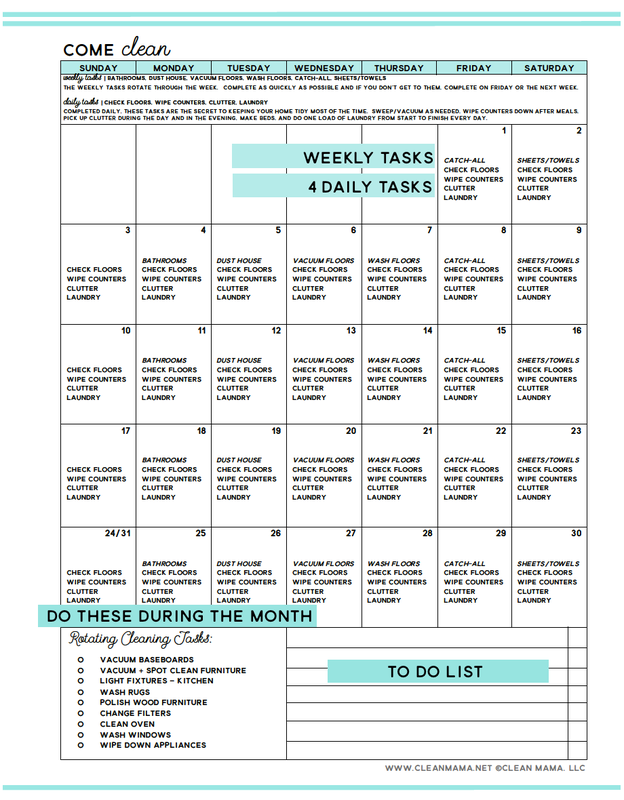 Read on, grab the FREE calendar for SEPTEMBER 2016 and get ready to see how doing a little bit everyday really is the secret to a clean house. Weekly and daily tasks are detailed at the top, rotating cleaning tasks are on the bottom of the calendar with a little checklist. How you use the calendar is up to you – put it on a clipboard, in your planner, on your refrigerator. Use checkmarks, draw lines through tasks or simply keep it up as a reminder. Want to join in on the fun? 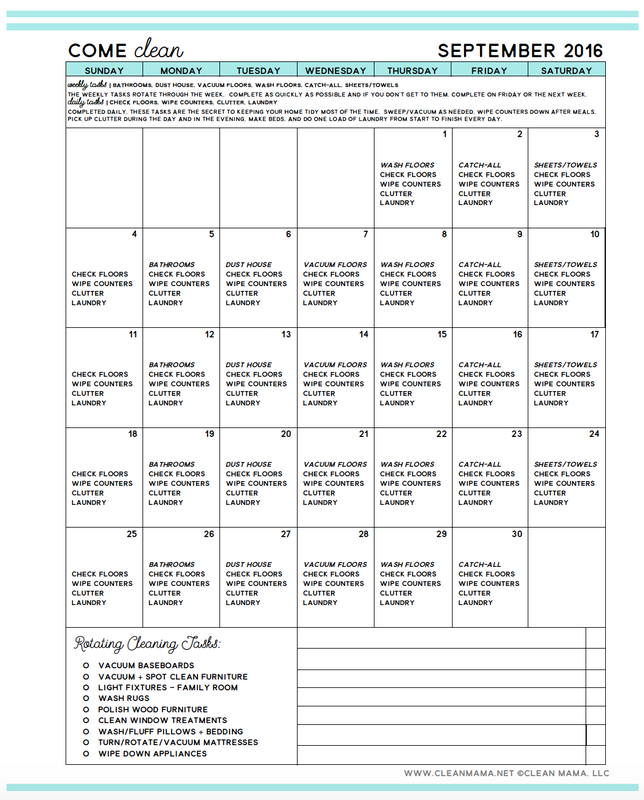 Grab a FREE cleaning and organizing calendar for September and join me! Follow along (subscribe in the sidebar) for motivational posts and tips to keep up with the daily and weekly tasks. I also post daily reminders on Instagram and Facebook and have a private Facebook group too called Homekeeping Society (just ask to join and I’ll add you) – it’s great for support and to meet others that are following along with my cleaning routine. Go here to grab your FREE calendar for September 2016! What do you mean by “catch all”? I already sent in my order and didn’t know about the free calendar. How can I get a copy? It’s a day to catch up on any uncompleted tasks – your order should have been emailed to you with the link for downloading. I already use Grove (I think I started through you a year or two ago). How can I get the Free Kit? O nevermind I see it ended the 28 August.